Bamburgh Cottages: Holiday Accommodation in Bamburgh, Northumberland. A picturesque historic village on the Northumbrian coast, in which we have a self catering cottage available for holidays. 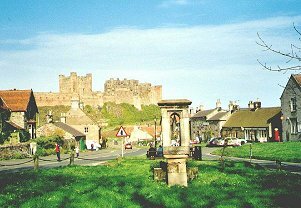 One of the most beautiful villages on the Northumbrian coast, Bamburgh is dominated by the magnificent castle. The village has a fascinating history stretching back to early Christianity and is totally unspoiled. Stone houses, four hotels, butchers, village store, restaurant and market garden, surround a small plantation known as The Grove. The village church was founded by St Aidan in 635 AD. Bamburgh is an excellent base for visiting the many attractions in Northumberland including historic houses, nature reserves, ancient castles, Kielder dam and reservoir, the spectacular Alnwick Garden, Roman wall, coastal villages and of course the old market towns, the city of Newcastle upon Tyne and Gateshead with the Baltic Centre for Contemporary Art, the Sage Music Centre and the Millennium bridge. Click below for details of our cottage.